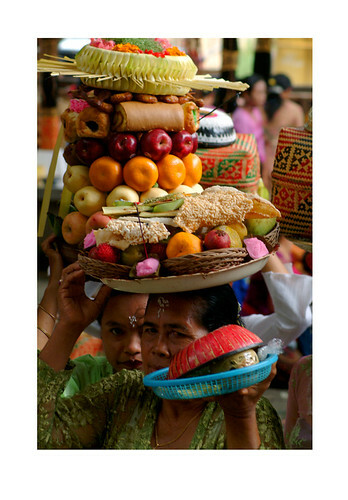 Women bringing offering to a temple ceremony in Ubud. The food is dropped off, then blessed and then brought home to eat. For the narrower meaning, Yadnya means an offering, worship, holy sacrifice which is often related with Banten (means in the Balinese offerings which is usually made from young coconut leaves, and containing fruits, flowers, leaves, betel vine, foods, cakes, and sesari (a little money as an offering).